ROYAL OAK, Mich. — The telegram made its maiden transmission in 1844. It was the first time human beings could send each other near-instantaneous messages over long distances. It was the Gilded Age's form of texting. Even though the telegram was phased out several years ago, it didn't prevent one such vintage message from finally reaching its destination 50 years after it was first sent. This story started in Ann Arbor, Mich. in Dec. 2018 when an employee at the digital marketing agency, ICON Interactive, was simply filing some paperwork in one of the office filing cabinets. 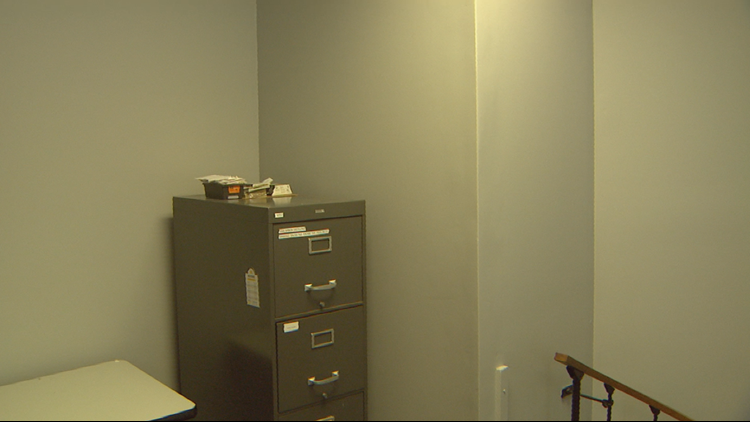 "I got a piece of paper stuck in the filing cabinet," said Christina Zaske, who is a business administrator for ICON Interactive. "The paper fell behind the drawer and all the way down to the bottom." This is the corner filing cabinet at ICON Interactive in Ann Arbor, Mich. where employee Christina Zaske discovered the 50-year-old telegram. The document was important, so she knew she couldn't just let it be lost. She bent down, opened the bottom drawer of the cabinet, then reached way in the back to see if she could grab it. "When I reached back there, I felt several pieces of paper so I just grabbed them all," added Zaske. "When I pulled them out, many were check stubs from a University of Michigan professor. I also found an old bank book with stamps in it back there. "Then I saw a waxed envelope that said 'Western Union Telegram' on it." The envelope was no longer sealed. Time had caused the sticky portion on the flap to pull away from the paper. 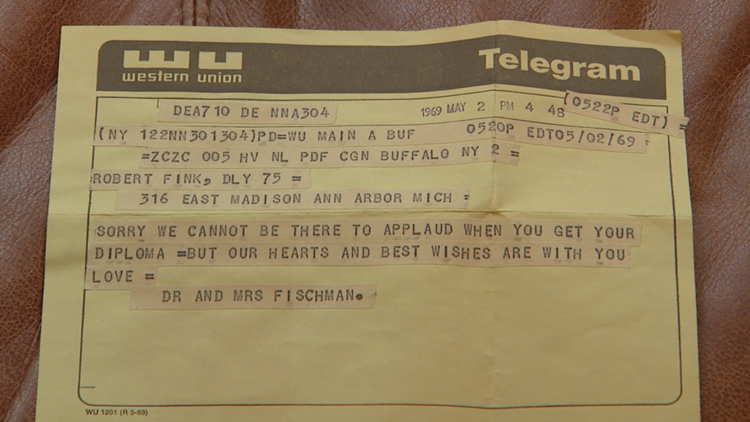 The telegram was sent from Buffalo, N.Y., dated May 2, 1969 and was addressed to a Robert Fink. "I assumed that somebody had already received the telegram, so I removed it from the envelope and read it." "Sorry we can not be there to applaud when you get your diploma but our hearts and best wishes are with you. Love, Doctor and Mrs. Fischman." This is the telegram that was sent by Ben and Lillian Fischman to Robert Fink in 1969. It was never delivered to Fink until Jan. 2, 2019. Rather than just tossing the telegram in the trash, Zaske immediately began to wonder if the telegram might have meant something to somebody 50 years ago. So, she decided to go on the internet and search for a Robert Fink. "I found a Robert Fink who was a professor a Oakland University," said Zaske. "There was an email address to Mr. Fink on the school's website so I sent him an email." Oakland University, which is located in Rochester, Mich., a suburb of Detroit that 51 miles northeast of Ann Arbor, happened to be off on Christmas break at the time, but Fink was checking his work emails from home. "I saw an email about a telegram," said Fink, who is wrapping up his 45-year career at Oakland University later this year. "I was very suspicious and thought it was a scam. "The email was from a Christina Zaske saying that she had found a telegram addressed to me inside an old filing cabinet." Fink responded to Zaske asking if she'd mail the telegram to him at Oakland University. When Fink returned to work on Jan. 2, the telegram was in a pile of mail near his desk. "When I saw it for real, it had a powerful impact on me," said Fink, referring to his reaction moments after opening and reading the telegram. "I was very surprised and touched that the Fischmans would've gone to that much effort to reach out to me." Ben and Lillian Fischman were the parents of Arnie Fischman, who was Robert Fink's childhood friend from when they were growing up in Buffalo. "I remember them being very nice people," added Fink. "They liked me and I liked them. "Arnie and I became close friends in 6th grade and remained pretty tight until our teenage years when he moved away and went to another school," said Fink. "When we graduated, I went to the University of Michigan and he went to Cornell University. "I think the last time I talked to him and saw him was in 1974." After the initial shock of seeing the telegram began to subside, Fink says he began reflecting back 50 years ago to the days and weeks around his college graduation and how he may have missed receiving the telegram. "The telegram was delivered a day after my roommates and I moved out of our apartment," said Fink. "I had no knowledge that it was ever sent to me until Christina's email showed up." As for how it ended up sitting in the back of an old filing cabinet for five decades, Fink says he has no clue. "We didn't have any filing cabinets in our college apartment," recalls Fink. "The telegram was likely never forwarded to me because my landlord didn't have my new address so somehow it ended up in that filing cabinet for 50 years." Robert Fink is likely the new answer to a trivia question: Who received the last telegram? "I suspect I am," joked Fink. Fifty years later, Fink says the telegram still has a meaningful and relevant message, just not the one that's printed on the paper strips that were glued to the page by the Fischmans. "It feels like the long arm of the past is reaching out to me, so I'm taking this experience seriously," said Fink. "Often, you have an impact on people that you may not know about then later in some ways find out about. "In certain ways, I appreciate [receiving this telegram] more showing up 50 years later. It's almost a richer experience than it would have been at the time. "I'm hoping that Arnie and I will be able to reconnect from this."